First time on land? Terranaut, the robotic exploration vehicle art project by Seth Weiner, is definitely the way to go. 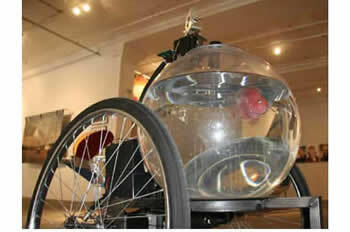 A Blood Parrot fish gets his first taste of life on land, wheeling around in this luxurious fishbowl-on-wheels. A camera mounted above the tank captures a stream of images; this information is worked over by the onboard computer. Finally, the direction of motion is determined and the wheels move in the direction that the fish is swimming. I love giving the "lower" species this kind of enriching experience. See Cockroach-Controlled Mobile Robot created by Garnet Hertz for a terrific example. Udpate 23-Sep-2006: Check out the comments on the Orz, alien fish in an sf-style game from the mid 1990's. From communist robot via Armchair Anarchist.